The island of Sicily is one of Italy’s most exotic wine destinations, with bewitching coastline, Greek ruins, Norman churches, Arabic fortresses, Baroque piazzas that look like a movie set, and out of this world cuisine that shows the diverse cultures who have left their footprint here. There are vineyards throughout the island and indeed the islands off Sicily such as Pantelleria where delicious dessert wines are made. Some of the most beautiful and interesting wineries on Sicily include Planeta, Tasca d’ Almerita, Ciro Biondi, and Donnafugata. The noble grape Nero d’ Avola makes delicious reds, and the white flagship Sicilian grapes include Inzolia and Zibbibo. 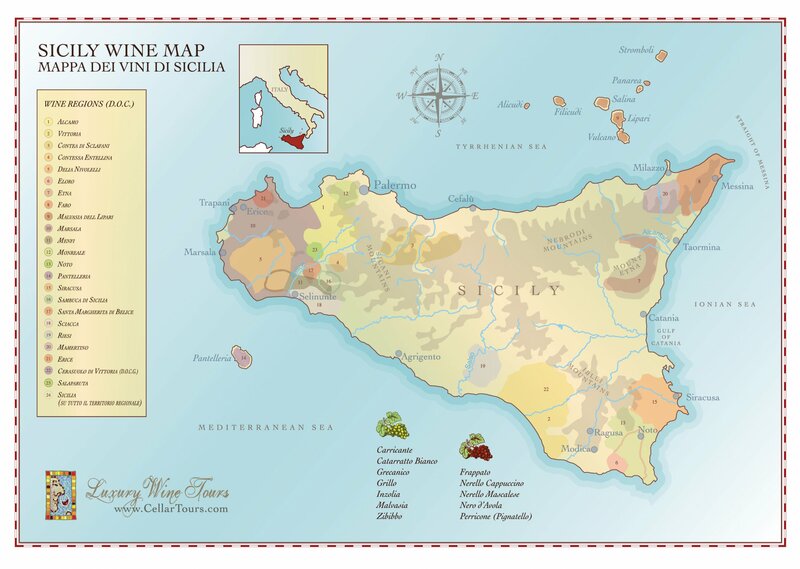 Embed Sicily Wine Region Map on your site: copy and paste the code below.